With losing our guardian Scout in November and Reina being occupied with raising babies, we lost quite a few hens to predators this winter. I hate losing hens. It makes me rather ill. And then with those losses, my thoughts immediately turn towards our curious and vulnerable lamb crop this season. They are venturing further away from their moms as the weaning is taking place, which puts them in an even more vulnerable position and leaves me feeling very nervous. We have heard coyotes and bobcats that are too close for comfort. 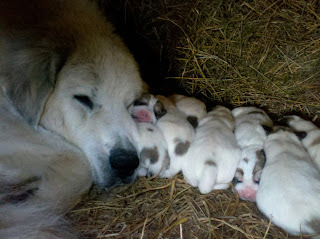 So far Reina has been keeping them at bay...but she works all night and is tired. This past week I found 2 possum carcasses, so Reina is guarding and protecting what she can - it's just been a lot for her and the farm is feeling it. 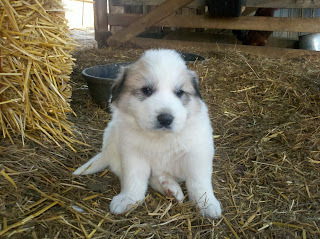 Our daughter, Holly kept a pup from Scout & Reina's litter in 2011. He's been an energetic and fun playmate for her but we have spent zero time nurturing his guardian instinct..until now. With all of our chicken losses we felt if there was ever a time, it was now to move Flynn permanently into the pasture to help lighten Reina's work load. 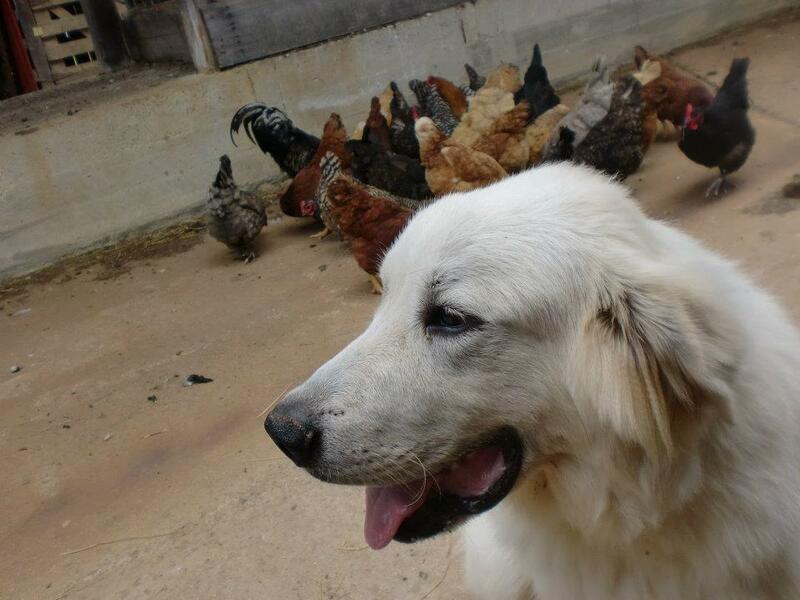 Flynn was born and practically raised in a chicken coop, so being gentle with the birds he had already conquered. I think he loves those birds just as much, if not more than I do! So moving onto the livestock was our next plan. Nothing will teach a dog a little space respect more than a bossy goat, so we introduced him to our Alpine buck and wether and to my complete delight, they all became fast friends. Flynn is a gentle giant and had proven he doesn't get easily wound up unless he feels threatened and so there was no more hesitation with introducing him to the young lambs. They all made that transition effortlessly. He is so much like his daddy. These boys have been a treasure..it's like striking gold everyday for me. I know good genetics play an important role in a successful livestock guardian but just as importantly is how these dogs are treated by humans. We really can make or break them. Flynn's guardian role started a little later in his life but he is proving to be the best lamb guardian we have ever had. The chickens gravitate towards him and now the lambs are joining them. What a precious story that tells. He was born for this.